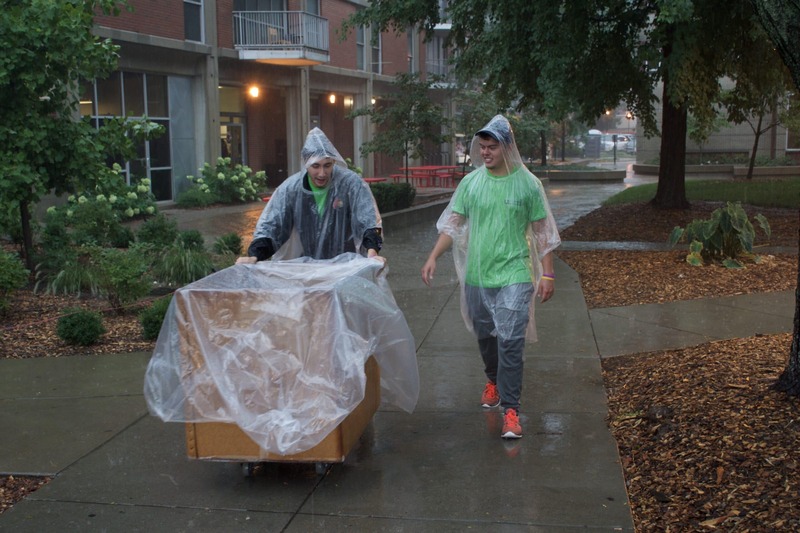 Move-in day was a sloppy affair for U of L students on Aug. 16. Heavy rains flooded Old Eastern Parkway and left most Belknap sidewalks ankle-deep underwater. Students and orientation staff braved the wet with wheeling boxes and dollies underneath ponchos and umbrellas to move belongings into their new homes. 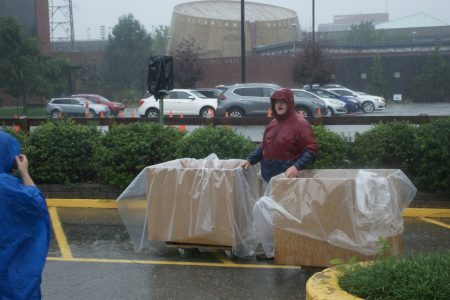 President Neeli Bendapudi even helped some students move into their rooms in Threlkeld Hall, along with Interim Provost Beth Boehm and Dean of Students Michael Mardis (below). 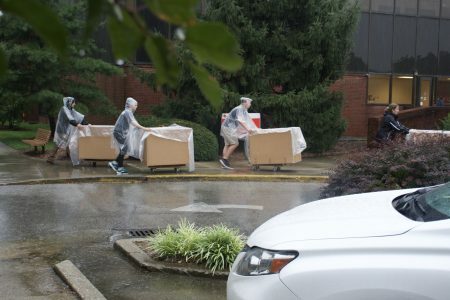 U of L’s incoming freshman class boasts nearly 2,800 students, and they’re all required to live on campus (unless they qualify for exemption). 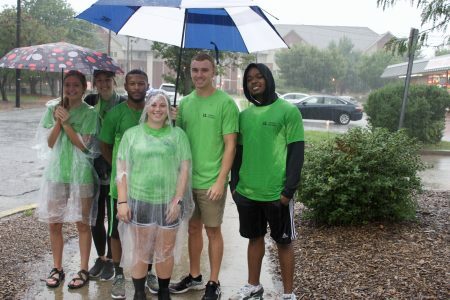 Though students just need to be moved in by the time classes start next week, hundreds braved the wet crowds on Thursday, the university’s official move-in day. 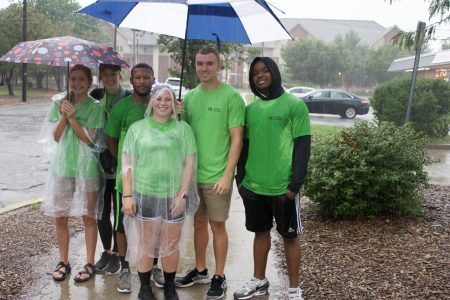 Assistant facilities manager Ty Corbin (below) used a walkie-talkie to communicate with other orientation staffers, making sure parking was running smoothly, and boxes and lifters were where they were needed. 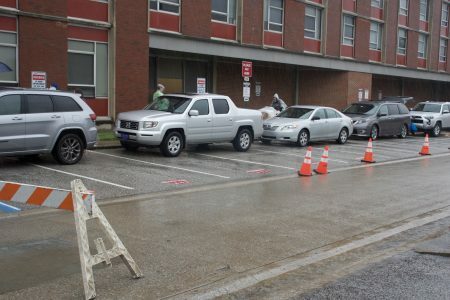 Staff used a two-lane system at many halls so students could park in one lane to check-in and get their keys, and use the other lane to unload. 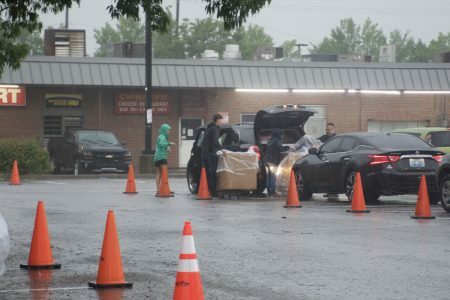 After making it to the front of the line, students were swarmed by a team of 3-4 movers, who would help fill rolling boxes with their things and take them inside. “It’s very quick. 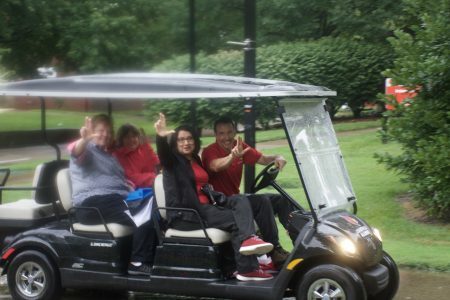 If you’re booking it each person can do it in 5-10 minutes,” Corbin said.